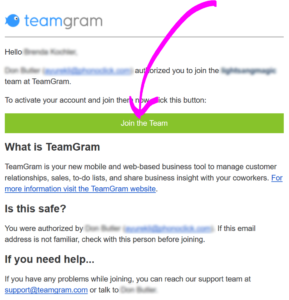 As a system administrator, you can decide who will access your company data in TeamGram. The people you authorize to access your TeamGram domain are called users. Typically, these will be employees of your company, but in some rare cases, you may also want to add consultants or other third parties as users. We highly recommend setting up your organization chart as described here, before adding users. You do not add users into your company’s TeamGram space directly. You invite them. They only gain access when they complete the registration process and accept your invitation. To invite a coworker as a user, click the Users tab on the left navigation menu. Then click New User. Name, Last name: Enter the name and last name of the colleague you are inviting. It is important to use proper capitalization because these names appear throughout TeamGram when they work on a record and are also used in quotes sent to customers. Position: This is an optional field that is used for display purposes. You can enter the work title or position of the user here, or leave it blank. Department: Choose the department of this user. This setting has some important security implications. Department names are specified in the organization chart. Role: Normally you can leave this as Basic user. Choose Restricted user only if you want this user to have limited access to records. Restricted users can only view and edit their own leads, deals, quotes, orders and custom app documents.Administrators have special privileges that other users don’t: They can invite and terminate users, change their departments, edit the organization chart, and a lot of other things that affect how TeamGram works. If you are inviting a user, you must already be an administrator. You can add other trusted users as administrators, but make sure they understand their responsibilities. Also remember that administrators can easily elevate themselves to the top of the hierarchy, and have full access to everything your company has in TeamGram. Primary email: Enter the work email of this user here. Make sure this is the email this person uses to communicate with customers and others outside your company. Save the form. TeamGram will send an invitation email to this person right away. Accepting an invitation is easy. Your users only need to open the invitation email, click the link in the email, choose a username and set a password. Please remind your users to use the link in the invitation email. Going to the TeamGram website directly and signing up for a new account will not grant them access to your company data. They can only become your users if they join by clicking on the invitation link. If a user you invited accidentally deletes or loses the email you’ve sent, you can go to the user’s page, click on that person’s name, and click Resend invitation. If a user leaves your company, you must remove that person from your user list. To do this, go to the users tab, click on the user’s name, and click on Remove from company. TeamGram will ask you to assign another user to take ownership of everything this person owns. Select one of your existing users and continue.